THE STORY OF THE CUMBERLAND TRIO– 50 YEARS OF GREAT MUSIC! 1) In December, 1962 The Cumberland Trio is formed by three Delta Tau Delta (Delt) fraternity brothers- Jerre Haskew, Andy Garverick & Jim Shuptrine & Tom Kilpatrick of Sigma Alpha Epsilon (SAE) fraternity at the University of Tennessee in Knoxville, TN. Jerre sings lead, Tom tenor, Andy baritone/bass & Jim plays bass but doesn’t sing. Tom, Jerre & Andy share solo verses. Andy plays 5 string banjo & lead guitar & Tom & Jerre play rhythm guitar- with Tom playing a nylon string flamenco guitar & Jerre steel string. 2) After months of practice together The Cumberland Trio enters the small group singing contest in May, 1963 at the big annual UT “Carnicus” show with 3,000 people in attendance. The Trio performs John Henry, Who’s Gonna Hold Her Hand & their own version of Mama Don’t Allow with special topical humorous verses written by Jerre. The Trio wins 1st prize of $50 and more importantly receives a standing ovation. They come off the stage feeling they could be something special. Jerre and his wife Barbara write several original songs including Barbara’s civil rights protest anthem I Wish I Were A Babe and Jerre’s children’s song, A Lion Named Sam. 3) After several months of playing in the greater Knoxville area, with clothing store owner Bob Newsome signing on as manager they record a tape of the folk classic All My Trials at WIVK-FM. Newsome submits the tape to the first National Collegiate Folk Festival singing competition to be held in Jacksonville, FL. Out of some 150 entries, the Trio is one of 15 groups selected to compete. 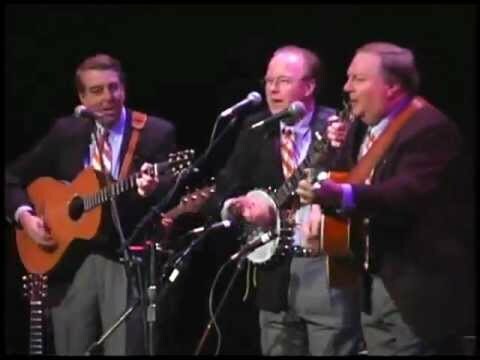 In late December, 1963 the Trio travels to Jacksonville performs four songs before a sold out crowd of 10,000 and wins 1st prize money and a scholarship for their University of Tennessee over very formidable competition. 4) In January, 1964 ABC-TV’s Hootenanny prime time Saturday night series, the network’s # 2 rated show, comes to UT to film two separate programs. The Cumberland Trio auditions beforeHootenanny talent coordinator Fred Weintraub, also owner of the famed Bitter End folk music club in New York City, who is impressed and adds the Trio to the first of the two shows. With 8,000+ people in attendance the Trio performs their signature fast tempo Gospel bluegrass song Ride Up and receives a standing ovation. Bill Monroe & the Bluegrass Boys & Doc Watson make their national TV debut on the same show. 5) As a result of their “Hoot” appearance and subsequent publicity the Trio performs many college concerts over the next three months in the southeastern US and also performs a sold out show with the Knoxville Symphony Orchestra & Choral Society. 7) In May, 1964 The Cumberland Trio travels to New York to record at Gotham Studios and at the same time RIC (Recording Industries Corporation), a new major record label based in New York City with offices in Nashville & Los Angeles, signs huge pop music stars Bobby Darin & Brenda Lee and offers the Trio a contract 5 times financially larger than that of RCA. The Trio records 12 songs at Gotham over 4 days as well as auditioning for two major talent agencies, Ashley-Steiner & William Morris, who tell them they need to develop a professional act including entertainment. The Trio returns to Nashville with offers from both labels and decides to sign with RIC, whose president Joe Csida, the former president of Capitol Records, makes the final sales pitch- telling the boys RIC will promote them and their new album heavily. RIC buys the NY tape from RCA. 8) In June, 1964 The Cumberland Trio rents the renowned old Hotel Greystone Playhouse in the popular Great Smoky Mtns resort town of Gatlinburg, TN, sets it up with excellent sound & lighting and performs two shows nightly six days a week from June 20- Sept 1 to develop and hone their live audience skills in anticipation of the album release and touring. In addition to playing bass, Jim becomes the Trio’s comedian as part of their new act. Almost all shows are sellouts and the Trio receives rave reviews from critics in several newspapers and folk music publications. One major folk magazine critic calls them even better than the # 1 act in show business, The Kingston Trio. 10) Over the next 35 years the guys remain close friends and all continue their musical interests as hobbies. Jerre leaves banking after 20 years and forms his own investment company which among it’s acquisitions buys Guild Guitars in 1986 whose unpaid endorsees under Jerre’s leadership include, Eric Clapton, Johnny Cash, Bon Jovi, Aerosmith & many other major artists. Andy leaves a successful 20 year banking career for the housing development business and Tom becomes senior partner at a major Atlanta law firm. Jim represents his brother, renowned water color artist Hubert Shuptrine, and publishes Jericho The South Beheld which becomes one of the largest selling art books in history. 11) In 2000 for their 37th Anniversary, Barbara surprises Jerre with the proofs of a new children’s book A Lion Named Sam based on the song Jerre wrote in 1963. As a result Jerre is motivated to remaster the 1964 RCA tape to CD which is successfully done by Steve Wallace of CWS Multimedia in Chattanooga, TN. Jerre forms his own independent label, Fiery Gizzard Records and releases the CD to rave reviews from folk music catalogs. 12) In the spring of 2001 Jerre sends several copies of the new CD to the Trio’s alma mater the University of Tennessee in Knoxville. The head of the UT National Alumni Association invites The Cumberland Trio to reunite for a reunion concert in Knoxville in November. The Trio decides to undertake the project and rehearses for 8 week ends in Chattanooga and Atlanta. They add uber-talented multi-instrumentalist Lou Wamp on dobro, fiddle & cello and Bob Wilkerson on electric bass to the ensemble, as original bassist Jim Shuptrine is unable to play. 13) On November 9, 2001, almost two months after 9/11, The Cumberland Trio performs a sold out 2 1/2 hour reunion concert at the historic Bijou Theatre Center in Knoxville. Steve Wallace assembles a group of TV camera operators and records the concert for audio and video using the Bijou soundboard mix and seven TV cameras. Jerre and Steve spend 4 months editing the audio and video and in 2002 Jerre releases on his Fiery Gizzard Records label The Cumberland Trio- Reunion Concert Live! on 2 disc CD & VHS Tape, again to rave reviews in folk and bluegrass circles. This inspires Jerre & Barbara to resume writing songs. 14) In June, 2002 the Trio performs at the huge Riverbend Music Festival in Chattanooga, TN to a sold out SRO audience and becomes the first side stage act in the history of the festival to be allowed by officials to play an encore, as the raucous crowd refused to stop applauding. The Trio does a repeat sold out SRO performance in 2005, adding the incredible female singer/songwriter Taylor Pie to the mix and is named Best Act of the Festival by Riverbend officials. 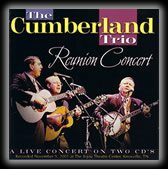 15) In 2003 The Cumberland Trio performs a very successful charity benefit sold out 2 1/2 hour reunion concert at the Chattanooga Theatre Center that is not recorded. The concert also features guest artists Taylor Pie, Dalton Roberts & Len Jaffe. 16) In the spring of 2004 the University of Tennessee invites the Trio for another official reunion concert at The Bijou in Knoxville, and on September 24, 2004 they perform a 2 1/2 hour sold out almost completely new concert called Back Where We Began with Wallace again recording it for audio & video. Jim Shuptine plays high end upright bass and Don Cassell mandolin in addition to the 2001 ensemble. Taylor Pie is also added to the mix as guest artist. Again after several months of editing, in the spring of 2005 Back Where We Began is released on 2 disc CD and DVD again to rave reviews. Armed with 3 excellent recordings from the ’60’s and the present, through RadioDirectX of Toronto, Canada, the Trio’s music receives significant airplay on over 700 FM radio stations around the world and becomes independent label distributor CDBaby’s top selling folk album series. The guys continue over the next few years to play together informally at various member family functions along with two other long time college & music friends, Jack Prugh & Ben Greer. Their music continues to receive significant FM radio airplay, and in 2009 36 videos from the two official reunion concerts are put up for viewing on You Tube. To date these videos have received aggregate views in excess of 1.9 million with their Bluegrass Gospel Medley recently passing the 400,000 mark. 17) In June of 2010 renown folk historian Nick Noble, host of Worcester, MA WICN-FM’s famed weekly program Folk Revival, broadcasts a special four hour show on the music and history of The Cumberland Trio with live on air interviews with Jerre & Barbara Haskew and Andy Garverick. Nick names Barbara’s 1964 civil rights protest anthem I Wish I Were A Babe as one of his top 50 folk songs of all time. 18) In the spring of 2012 Jerre receives an email though The Cumberland Trio website from Bradley Reeves, executive director of the Tennessee Motion Picture & Sound Archives informing Jerre that TAMIS was preparing a documentary on ABC-TV’s two January 1964 Hootenanny shows filmed in Knoxville, requesting that it center on The Cumberland Trio’s national TV debut. Jerre takes him all the Trio’s released recordings as well as all other old reel to reel tapes that were in Trio members’ possession. One of these old tapes proved to be an exciting new discovery as it contains a recording off acetate 33 1/3 rpm disc of the Trio’s thought to be long lost May 1964 New York recording sessions at Gotham Studios! This tape had been made by Tom’s late Dad, Joe Kilpatrick. Reeves digitizes the tape to CD and sends it to Jerre. Scratching sounds from the acetate disc could be heard as well as ‘wows” and distortions, but the music itself sounds incredibly good. So Jerre sends the digitized CD to Andy Laird of Spare Time Music in Carlsbad, CA who had mastered the Trio’s 2004 Back Where We Began reunion concert CD. What Laird is able to do with this old tape proved to be nothing short of miraculous, making it sound like it is done in studio today. So finally The Cumberland Trio’s full circle of music is complete and The Cumberland Trio, Lost & Found- The 1964 New York Sessions was released as a new CD in August, 2013. It’s on air debut was made August 9. 2013 by Nick Noble on another four hour special broadcast on WICN-FM’s Folk Revival entitled – The Story of The Cumberland Trio- 50 Years of Great Music!